Home | New Releases | Valeria Yost Open Edition Gallery Wrapped Canvas:"Wilderness Walk—Grizzly"
Valeria Yost Open Edition Gallery Wrapped Canvas:"Wilderness Walk—Grizzly"
Size: 18"H x 36"W x 1-1/2"D.
Medium: Gallery Wrap Canvas- Ready to Hang. Open edition from the Gallery Wrapped Canvas Collection. Arrives ready to hang, this unframed canvas bears a clean, contemporary feel. 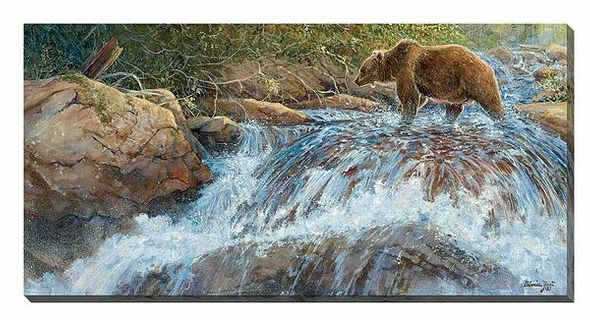 Home | Fine Art Prints & Limited Editions | Wild Wings | Wild Wings New Releases | Valeria Yost Open Edition Gallery Wrapped Canvas:"Wilderness Walk—Grizzly"
Home | Fine Art Prints & Limited Editions | Wild Wings | Valeria Yost | Valeria Yost Open Edition Gallery Wrapped Canvas:"Wilderness Walk—Grizzly"